It's fall now, so it's time for fall-flavored cocktails. My go-to autumnal ingredient is apple juice. 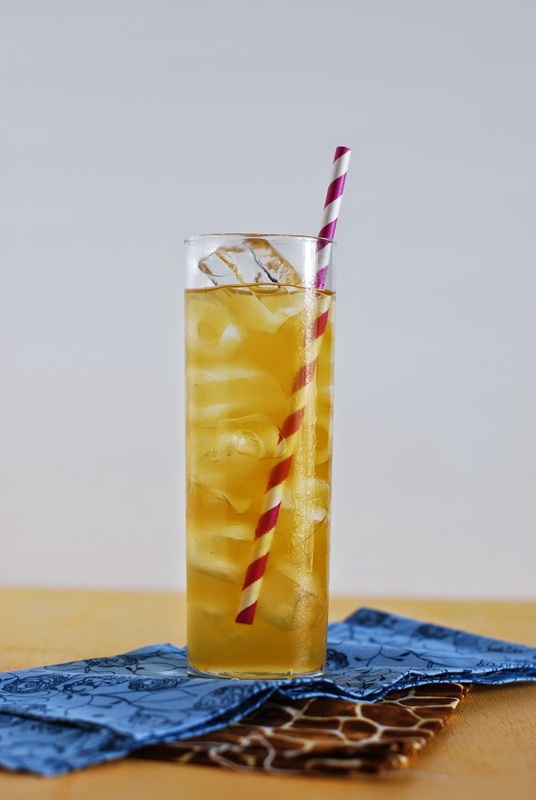 As soon as you add apple juice to a drink, it instantly becomes appropriate for the cooler weather. Apple cider means you're really ready for changing colors, vests and scarves. That's why this drink is kind of an in-between summer and fall drink. There's some tequila (because, let's be honest, it's still hot - at least in Utah), some apple juice and apple schnapps because we want it to be fall and some homemade ginger syrup just for kicks. We used to have beets every year at Christmas. When we'd go up to the farm each December, there they were. A bowl of beets. I don't think anyone ate them. I didn't know it at the time, but apparently they were canned. And therefore disgusting. Because of this quite unpleasant experience year after year when my cousins, sisters and I would dare each other to eat one (a whole one! ), I always thought that I didn't like beets. Then, one summer, not too long ago, I had a fresh one! Game changer for sure! Beets are amazing! They taste just like the earth and dirt - in a great way! Plus, they're bright red/pink which makes them extra fun. When you make beet pasta, it's really more for the color. Most of the beet flavor is lost, but there is definitely a hint of that earthiness in there. I like desserts with 'dessert' in the name. It just seems really upfront and honest. It's not trying to get away with anything. It's basically the opposite of Frog Eye Salad which is not a salad, nor does it have frog eyes in it. Cherry Dessert was something that we ate a lot of growing up in the Midwest. So, you know it's good. It's good in only the way that Midwestern food can be. There are no claims that it's good for you or low-fat. And, for good measure, it's made in a casserole dish. If we wanted to get even more transparent about this dessert, we could call it graham-cracker-crust-whipped-cream-cream cheese-and-cherries dessert. But that gets a little long, IMO. So, 'Cherry Dessert' it is! September 8 | Shoddy Canadian craftsmanship. I'm a shower person. I like long showers where the water never gets cold and no one is knocking on the door telling me to get out. I'd really like to be a bath person, and every once in a while, I try. But, I just can't. I never know how to keep my hands and my book above the water. I don't like it when it's so hot at first that it scalds your feet to get in, but I also don't like it when the water starts to cool down. Clearly, I'm doing it wrong. Part of the reason I want to like baths is because I do like all the bath paraphernalia.